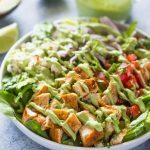 A refreshing low-fat chopped chicken, tomato, and onion salad topped with a healthy creamy avocado dressing. Since fall has fallen upon us (get it? ), this might be the last salad I post this season. Fingers crossed though because I practically live on salads… I’ve been meaning to share this chicken salad all year but kept getting side tracked with all the other salad recipes I’ve posted. Alright so let’s jump right into this delicious salad. The star of this salad is definitely the creamy avocado sauce. It’s my go to salad dressing and it also seems to be a crowd favorite as well. I love it because it’s ready in just minutes. You simply toss a few simple ingredients into your blender and it’s like magic. A creamy, tangy, rich and delicious sauce that is unbelievably good on anything. I obviously use it on salads but don’t let that stop you. I’ve had this sauce in sandwiches, burgers, rice, and even pasta! To begin making this salad, pan sear the chicken until tender and golden. 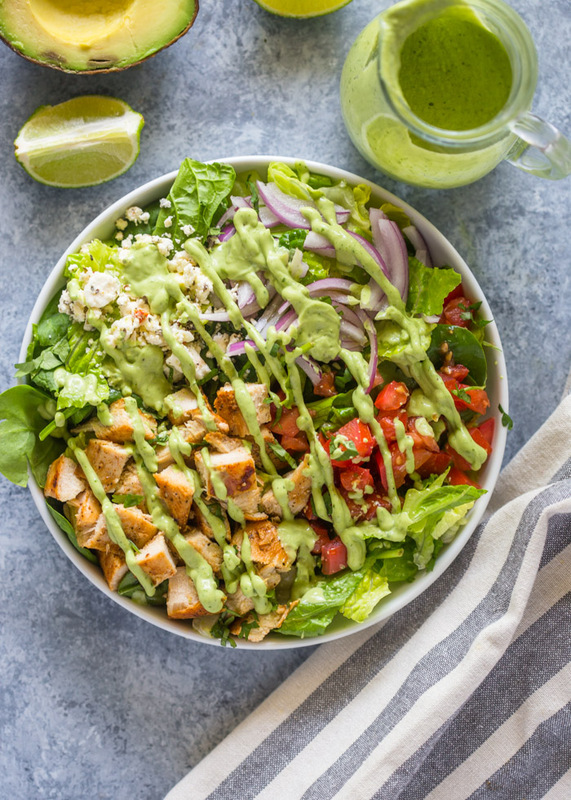 While the chicken is cooking, chop up all the ingredients for the salad and blend the ingredients for the dressing in a blender. Then when the chicken is done, chop it and toss it on the salad. Top with dressing and boom! 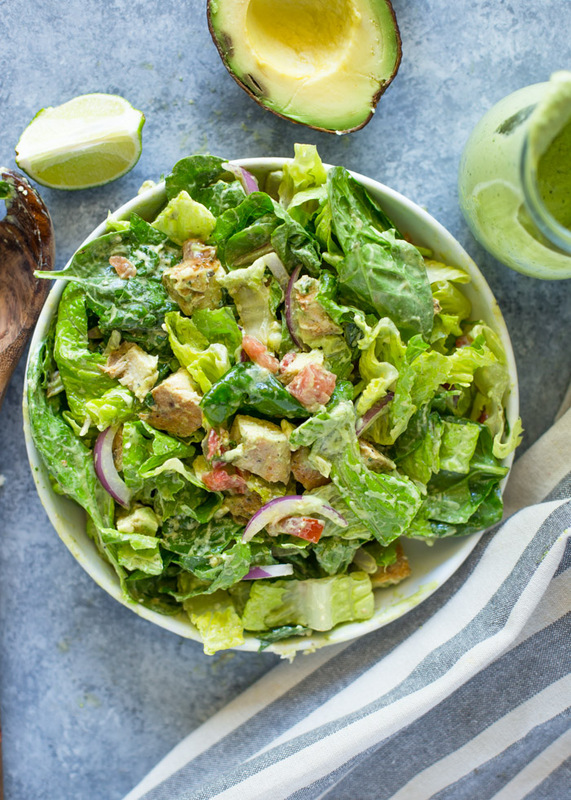 A healthy, fresh, and incredibly flavorful salad is ready in under 20 minutes! <span class="mceItemHidden" data-mce-bogus="1"><span></span>To cook chicken: In a medium bowl or ziplock bag, combine the chicken, olive oil and spices. Mix until chicken is fully coated. Pre-heat a medium heavy duty pan to medium high heat. Place chicken in pan and cook for 6-7 minutes per side or until chicken is tender and inside is cooked. Cool in pan for 3-4 minutes then transfer to a cutting board. Cut into slices or cubes. While the chicken is cooking, chop all ingredients for the salad and place in a large bowl. To make dressing: Combine all the ingredients for the dressing in a blender or food processor. pulse for 1 minute or until the dressing is creamy. Add more water as needed. Dressing will keep fresh covered in the fridge for up to 1 week. To assemble: Serve salad in a large bowl or assemble into two small salad plates. Divide romaine lettuce and baby spinach onto two plates. top each plate with tomatoes, onion, and feta cheese. Serve with dressing on the side or drizzle dressing onto salads. 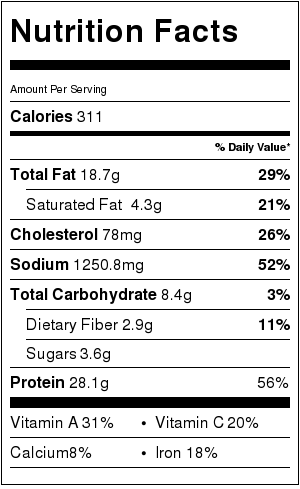 The salad without the avocado is just 311 calories, assuming you add the feta cheese. 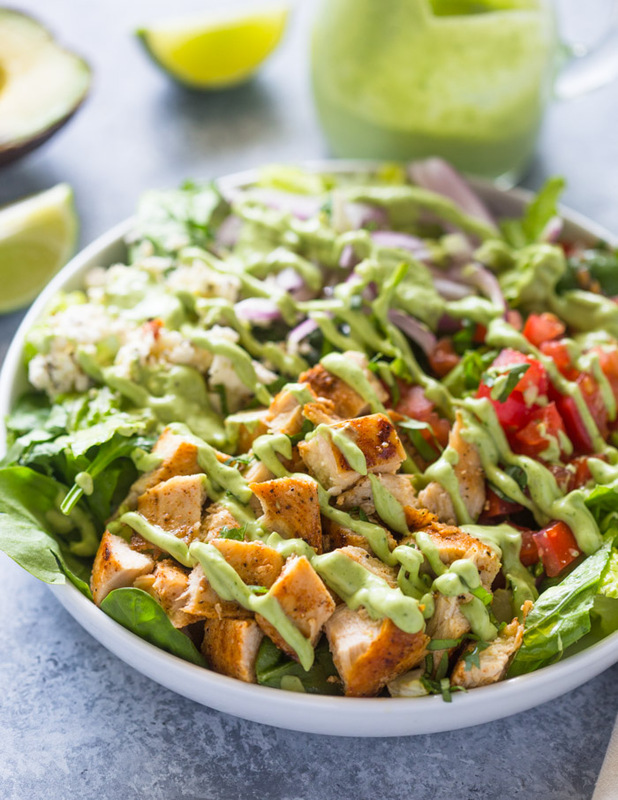 The avocado dressing recipe is enough for two salads and is 190 calories per serving, assuming you use all the dressing on the salads. 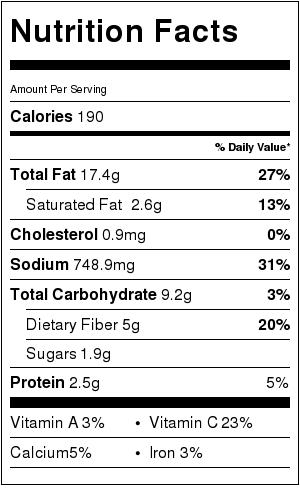 Keep in mind the calories and fats in avocados are naturally high and good for you! Hi.. I’m not sure if I am missing something here! Where is the actual recipe ? SOrry about that, Lubna. We’ve fixed the issue. The recipe should show up now! roughly chopped is fine. Some people like their greens finely chopped and some people roughly chopped so it’s up to you!